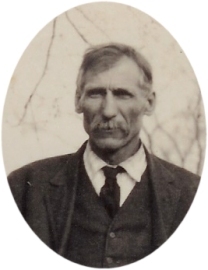 This is Mary Etta Goebel Carey's Uncle John as mentioned in the Ralph and Mary Carey Story. "John Goebel was born at Scranton Kansas, December 20, 1864, and after a lingering illness passed away at this home in Hardtner, Kansas, February 7, 1948, his age being eighty-three years, one month and seventeen days. He was united in marriage to Anna Gilcrist and to this union three children were born: Frank Goebel of Denver, Colorado; John Goebel, jr. of Atlanta Georgia; and Jean Goebel Tucker, deceased. His wife passed away in June 1896. In his early manhood he worked in the coal mines of Osage County, Kansas. In 1896? he, with his brothers William, Henry and Frank came to Oklahoma and homesteaded North of the Fritzlan ranch in Woods county. On December 25, 1905 he was united in marriage to Francis Berry Morris and to this union six children were born: Edison Goebel of Los Angeles, California; Phil Goebel of Shelton, Washington; Sgt. Joe Goebel of Salina; Mrs. Wilma Kiefer of Kiowa; Mrs. Marjorie Nagel of Edmond, Oklahoma and Mrs. Geneve Roberson of Capron. In 1913 he sold his farm and moved to Hardtner, where he ran a blacksmith shop until a few years ago. When his health failed, he sold his business and retired. Since that time he has enjoyed hunting and fishing and gardening. He took a great pride in his garden. His final illness was of several weeks duration but he bore it patiently to the end."